I've told you before about telomeres and how they affect us as we age. In case you've forgotten, telomeres are "caps" on the ends of our DNA. They help protect our DNA from damage. Think of them like the protective plastic on the end of your shoelace. Scientists have known for some time that short telomeres are linked to everything from tissue damage, inflammation, and insulin resistance to heart disease and aging. You want to do everything you can to keep your telomeres long. Some activities, such as exercise, can actually lengthen them. And others, such as smoking, shorten them. Of course you know that smoking is bad for you. But you may be doing something that's just as bad for your telomeres as smoking. And you may be letting your kids do it too. What is this dangerous activity? It's drinking sugary soda! A new study conducted by scientists at the University of California San Francisco and published in the American Journal of Public Health found that the more sugary soda people drink, the shorter their telomeres tend to be. Senior study author Professor Elissa Epel reports, "Regular consumption of sugar-sweetened sodas might influence disease development, not only by straining the body's metabolic control of sugars, but also through accelerated cellular aging of tissues." This is bad news for Americans. Every day, one in two people will drink a soda. One in four will have at least 200 calories' worth of soda, and 1 in 20 will take in 567 calories from soda! We've known that these high rates of soda consumption are contributing to rising rates of obesity. But people don't realize that these drinks aren't just making them heavy, they could actually be making them older. When researchers measured the telomeres of participants in the study, they found an association between consuming 20 ounces of soda a day and 4.6 years of additional biological aging based on the telomere lengths. Professor Epel said, "This finding held regardless of age, race, income, and education level. Telomere shortening starts long before disease onset. Further, although we studied only adults here, it is possible that soda consumption is associated with telomere shortening in children as well." If you drink soda to bring your blood sugar up or you're worried that quitting it will affect your blood sugar — or you've never been a soda drinker but still struggle with your blood sugar, Metabolic Defense can help. This exclusive blend of blood sugar balancing herbs and nutrients offers you total protection from all the causes and complications of high blood sugar. 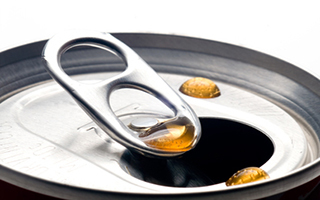 Soda can't offer you any benefits — all it can do is age you prematurely and contribute to weight gain. Metabolic Defense is the most powerful way I've ever seen to balance your blood sugar. And you'll keep your telomeres from shortening prematurely at the same time. American Journal of Public Health, 17 October 2014.